FARGO – Internal documents obtained by the High Plains Reader from the Cass County Sheriff’s Department reveal a disturbing familiarity between state police chiefs and sheriffs with TigerSwan’s analysts and upper echelon. In early September 2016, oil magnates, private security personnel, and law enforcement cooperated in creating a “rhythm” for moving the Dakota Access Pipeline forward – together. Four days after security dogs were brought to the front line on September 3, 2016, TigerSwan’s first situation report, on September 7, 2016, made public by The Intercept, stated the private security firm’s initial intentions: to create a clear SOW, or scope of work, to empower a PAO, or strategic command public affairs officer to tell the world that “we [DAPL] are the good guys,” and establish rules for the “Use of Force” for all security elements involved. TigerSwan, a security firm with an extensive background in counterterrorism operations in the Middle East, worked quickly. The day of the attack dogs had attracted too much criticism from media outlets around the world, which echoed 1960s civil rights abuses in Birmingham, Alabama. The elusive security firm had much ground to cover and an agenda to solidify: protect the Dakota Access Pipeline (DAPL). “Tomorrow evening you are authorized to release Precision to continue working towards Highway 6 just south of St. Anthony under three conditions,” TigerSwan’s Gary Winkler wrote to Danzeisen later that same day. Winkler’s conditions in the email stipulated police needed to share written information and scatter sheets with Sweeney on a daily basis. “We need them every evening to plan the next day’s kickoff (starting tonight). “Using those plans, Shawn Sweeney is able to communicate effectively and timely with law enforcement on a daily and hourly basis. We will avoid any confrontations with protestors, and no dogs are to be used." 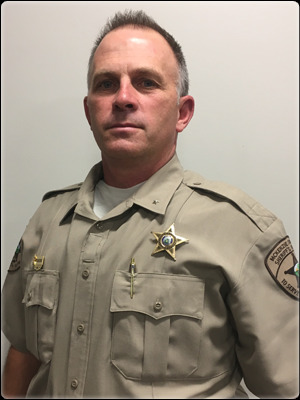 - Williams County Sheriff Scott Busching, who oversaw county law through the Bakken’s most recent oil boom, resigned his post in April 2017 after 18 years. - McKenzie County Sheriff Gary Schwartzenberger, colloquially known as the “terrorist sheriff,” who was suspended from office due to “misconduct, malfeasance, crime in office, neglect of duty or gross incompetence,” along with harassment and intimidation for fostering a “quasi-military environment.” North Dakota Governor Doug Burgum reinstated Schwartzenberger in August 2017, which sparked controversy. 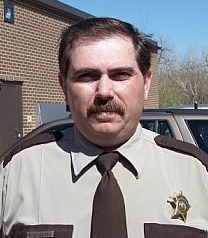 Six officers of the McKenzie County Sheriff’s Department left, three in one day, and another officer was fired, according to media reports. - Cass County Sheriff Paul Laney, a former Marine who ran point on the ground during much of the Dakota Access Pipeline controversy. 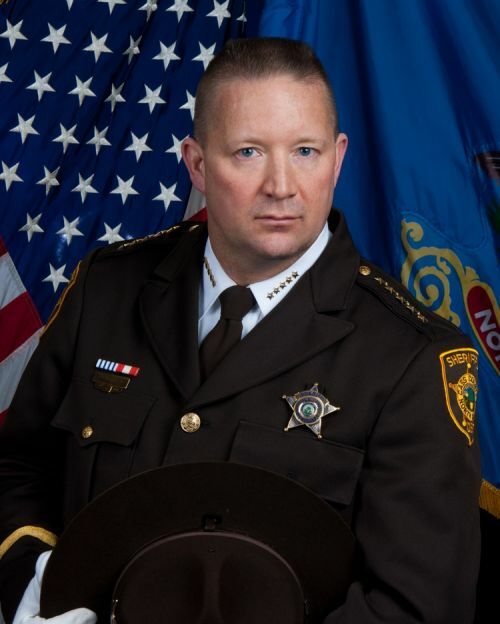 Laney, president of the North Dakota Sheriffs and Deputies Association, also serves on the board of directors for the North Dakota Association of Counties. He is currently in his third term as an elected peacekeeper, but decided recently that he will not run again. 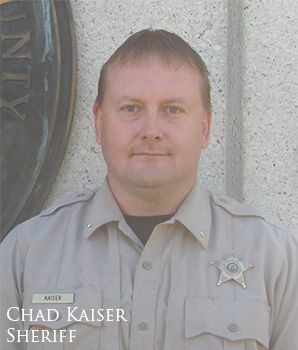 - Morton County Sheriff Kyle Kirchmeier, who was the head of law enforcement operations during the Dakota Access Pipeline, coordinated hundreds of law enforcement officials from dozens of agencies across the United States.- Stutsman County Sheriff Chad Kaiser feared for his life when he claimed the helicopter he was in was attacked by arrows and buzzed by a drone, according to media reports. 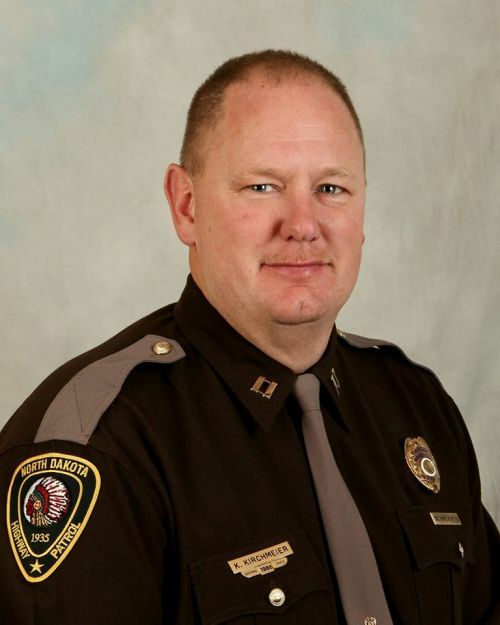 - Mandan Police Chief Jason Ziegler, a former Marine who served in the Gulf War, became Mandan’s police chief in 2015. Danzeisen is the author of an October 2016 letter to U.S. Attorney General Loretta Lynch and others, claiming Standing Rock activists were armed, hostile, and engaging in training exercises for conducting violence. The morning of September 14, 2016 started off with a picture from TigerSwan’s senior vice president, Shawn Sweeney, to Danzeisen. It was a photograph of a Native American holding a drum in one hand and speaking into a handheld radio with the other. The picture was taken at 8:58am, and was sent to Danzeisen seven minutes later through Sweeney’s smartphone, according to email time logs. The fusion between TigerSwan and local law enforcement agencies began before September 12, 2017, according to TigerSwan’s internal situation reports. 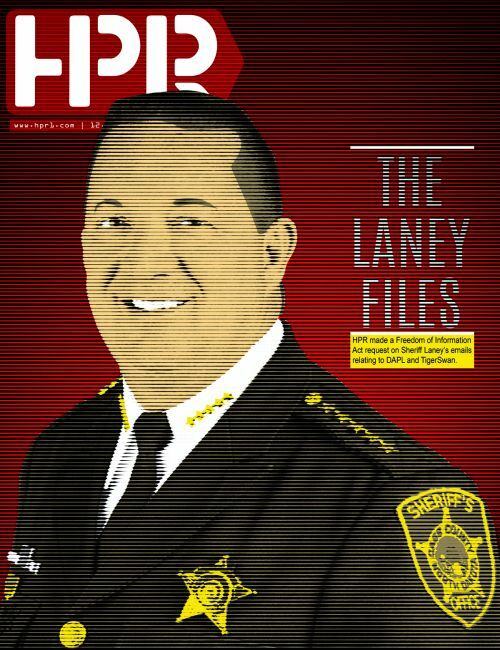 The timing is confirmed by an email entitled “Protesters in your county,” from Laney on September 14, 2016, to sheriffs involved in the controversy. “The protesters that have been doing this aren’t the typical protesters on Standing Rock,” Laney’s email continued. 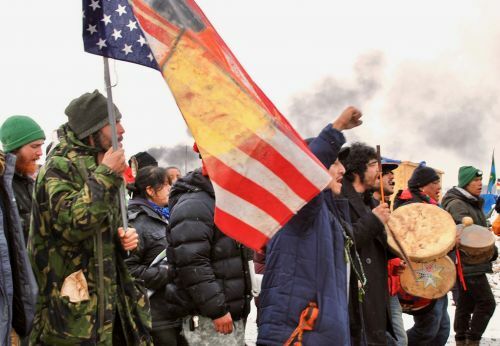 “These protesters, while having some natives mixed in with them, are mostly white hippies. They are the more radical of the groups here and have been the ones attaching themselves to equipment. From the onset, one goal of TigerSwan was to create dissension within the camps. TigerSwan analysts described a sense of urgency in attempting to obtain information, which was at best difficult, a September 22, 2016 informational report stated. TigerSwan personnel have years of experience working in counter-terrorism in MENA, or the Middle East and North Africa, West Africa, and other places, according to its website, and the arrival of a small group of Palestinians at the camps disturbed the security firm’s analysts. The cooperation extended beyond DAPL security and law enforcement, according to an email from Michael Futch. Instructions at times originated from Energy Transfer Partners and were sent to TigerSwan personnel, which were then forwarded to law enforcement. Futch spoke for Energy Transfer Partners in an email on September 14, 2016. In the email, he rained praise on Billy Lambeth, construction manager for “Spread 09,” the pipeline route near Williston, and warned law enforcement of upcoming threats. Futch continued the email, saying that so far, Spread 09 had been lucky, flying “under the radar,” but Lambeth needed assistance. Futch made two requests of law enforcement: first, that threats identified by DAPL security be communicated through Lambeth’s chain of command, and second, to know locations of all law enforcement and security and develop a plan for handling protest activity and evacuation. Roads needed closing as well, Futch wrote, an idea he mentioned 40 days before Highway 1806 was shut down by law enforcement. Precision Pipeline, LLC, or PPL, is a company headquartered in Wisconsin, and was one of the companies awarded contracts to lay pipe by Dakota Access Pipeline, LLC, according to the Pipeline & Gas Journal. Activists fighting the Dakota Access Pipeline – also known as water protectors – had hit lists, and doxxed police officers, officials report. The North Dakota State and Local Intelligence Center, or NDSLIC, reported 10 incidents of surveillance tactics used against law enforcement officials from August 21, 2016 until September 4, 2016. On September 29, 2016, a surveyor on DAPL Spread 6 named Luther Body was also threatened through Facebook messaging services, according to an email sent to Energy Transfer Partners by Dan Junk, of Wood Group Mustang, an energy engineering company in Canada, and then forwarded to authorities. Early intelligence was based primarily on Morton County tips from social media, and sighting of individuals of interest including libertarian Nathan Seim, Gabriel Black Elk, and Winona LaDuke, according to an unclassified report compiled by the NDSLIC. The NDSLIC is the states government’s eyes and mouthpiece, whose mandate is to gather, store, analyze, and disseminate information on crimes, both real and suspected, to law enforcement, government, the community, and private industry regarding drugs, fraud, organized crime, terrorism, and other criminal activity. The NDSLIC listed media outlet Unicorn Riot, in top place, Native Lives Matter, United Urban Warrior Society, Urban Native Era, Gavin Seim for Liberty, American Indian Movement, Rez Riders, Indigenous Environmental Network. Analysts pointed out Winona LaDuke, founder of Honor the Earth, and Gabriel Black Elk of Native Lives Matter, among others. LaDuke, an environmentalist, economist, and writer, who ran for Vice President of the United States as the Green Party candidate, stood in the NDSLIC’s crosshairs because she was well known and frequently addressed the needs of the Native environmental movement, desiring to break up the geographical and political isolation of Native communities, and to increase their financial resources. “Critical infrastructure” needing protection in the state included the Northern Border Natural Gas Pipeline, which runs adjacent to the Dakota Access Pipeline, the Basin Electric transmission line, North Dakota Highway 1806, Cannon Ball River Bridge, or Backwater Bridge, and the South Central Regional Water District Intake and Treatment Plant. 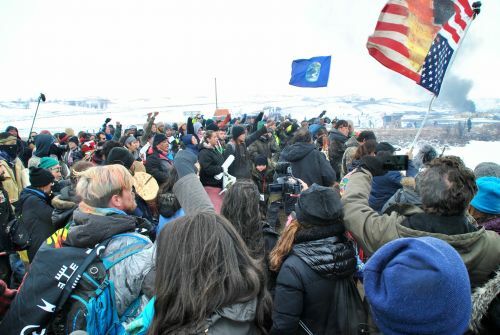 Law enforcement echoed Energy Transfer Partners’ intent to block off Highway 1806, declaring it a vital access to the “flow of commerce and emergency responders to and from Standing Rock Indian Reservation. 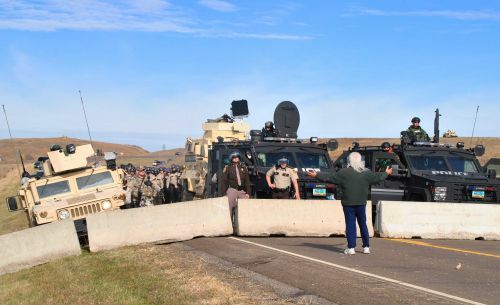 “There is potential for barricades to be setup on or near the bridges to prevent travel of either law enforcement/emergency responders (by protestors) or protesters (by law enforcement),” analysts reported. On September 29, 2016, at 11:59am, TigerSwan issued an “urgent priority” report claiming upcoming violence for the following weekend. The threat assessment came from Ashley L. Parsons, a former analyst in TigerSwan’s Houston office, and was sent to TigerSwan personnel in North Dakota, including Kyle Thompson, according to emails. Thompson is the former Leighton Security Services employee who was carrying an AR-15 automatic assault rifle, the kind used in most mass murders, and was disarmed by activists after reportedly driving a pickup truck at high speed toward the main camp on October 27, 2016, the day the North Treaty Camp was overrun by law enforcement. Parsons also self-reported she has active Top Secret/Sensitive Compartmented Information clearance. Sweeney sent Parsons’ information to Danzeisen, who forwarded the email to the group of sheriffs. From there, the scare gained credence; the digital trail led to Lynn Woodall, a captain in the Morton County Sheriff’s Department. “DAPL Security Intel has passed along the following information,” Woodall wrote to 28 recipients. The next morning at 7:19, Morton County’s Emergency Manager Tom Doering forwarded the same information to 116 others involved in law enforcement, and game wardens, postal service agents, the Federal Bureau of Investigation, the Bureau of Criminal Investigation, NDSU police, U.S. Attorney’s Office National Security Intelligence Specialist Terry Van Horn, and other organizations in North and South Dakotas, and Montana. 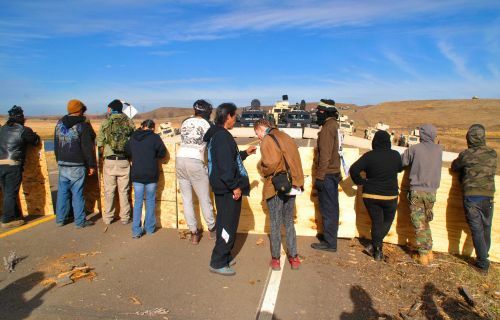 Sixteen days before the threat assessment was disseminated, Morton County reported 60 activists, including former Standing Rock Sioux Chairman Dave Archambault, had been arrested. By October 13, the numbers arrested slowly swelled to 123, and ten days later arrests skyrocketed to 269. Nothing, however, happened during the weekend TigerSwan was worried about. Officials made a careful list of all who attended a meeting between Standing Rock and law enforcement representatives at the Morton County Courthouse. Archambault requested the meeting, but was unable to attend, and sent Greta Baker, Virgil Taken Alive, John Eagle Shield, and Lee Plenty Wolf in his stead. The representatives were worried about security dogs used by DAPL security teams. 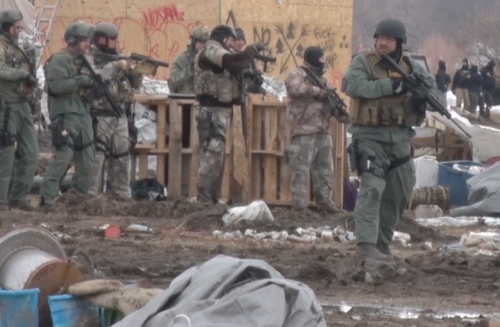 Law enforcement, represented by Morton County Sheriff Kyle Kirchmeier, Cass County Sheriff Paul Laney, US Marshal Paul Ward, Major General Alan Dohrmann, and Jake O’Connell of the FBI, said the dogs had no connection to law enforcement, and belonged to DAPL’s private security. Morton County Sheriff press releases at the time reported DAPL security personnel were injured, but made no mention of activists being bitten. Dogs, according to Angela Bibens, the camp attorney at that time, bit at least six activists. Law enforcement denied any knowledge of yellow helicopters flying around the camps, saying they must belong to DAPL’s private security, according to court paperwork. Direct answers were rarely given during the meeting. Law enforcement asked why children were placed close to front lines, to which Standing Rock representatives answered, saying children, as direct stakeholders, had a right to participate. Among other topics discussed during the meeting, cultural differences became one Standing Rock representatives attempted to clarify. Included in documents obtained from Cass County Sheriff’s Department is a Dakota Access Pipeline Project plan for unanticipated discoveries along the pipeline route. Discoveries included cultural resources, human remains, paleontological resources, and contaminated media. The plan was to be implemented across all lands in North Dakota, regardless of ownership, but not one mention is made throughout the five-page instructional of the request to notify Indigenous cultural liaisons or qualified personnel of culturally relevant findings. 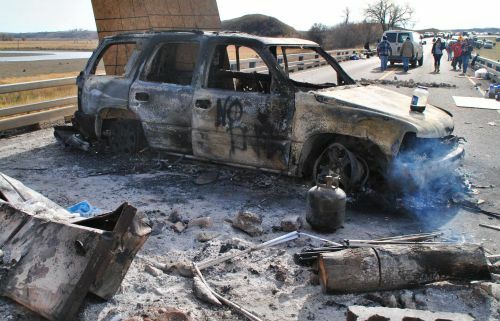 If such items as charred spots, arrowheads, stone artifacts, human remains, or paleontological resources were discovered, the sightings were to be reported to archaeologists affiliated with the Secretary of Interior’s Qualification and Standards, or the State Historical Society of North Dakota, within 48 hours. Other findings, such as contamination including buried drums, discolored soil, chemical or hydrocarbon odors, oily residues, were to be reported to DAPL Project Environmental Manager Monica Howard. Dakota Access Pipeline retained Alpine Archaeological Consultants, Inc. and Matthew J. Landt, as the company’s archaeologist, and listed Paul Picha, chief archaeologist with the North Dakota State Historical Society, as another option. In September this year, Energy Transfer Partners wired $15 million to the state-owned Bank of North Dakota to help with the $43 million the state borrowed to end the resistance camps against the Dakota Access Pipeline. Dakota Access Pipeline personnel also returned to the state earlier this year to hand out paychecks worth hundreds of thousands to first responders in North Dakota, South Dakota, and Iowa. Citing pending litigation issues, law enforcement agencies refused to comment on questions pertaining to their involvement with TigerSwan.